To put it simply, the LaCie FUEL is a 1 or 2TB hard drive that can connect via WiFi to just about any device. The sleek-looking, rugged package is built for those on the go. LaCie FUEL takes documents and media wherever you need to go. 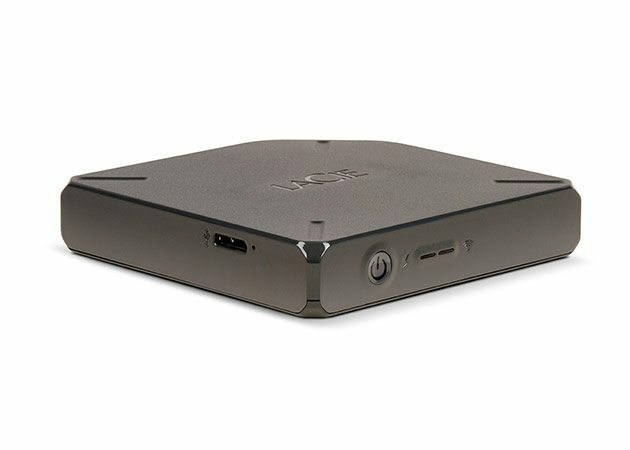 The LaCie FUEL measures just 4.5 x 4.5 x .9 inches, weighs in at 9.7 ounces, has a Wi-Fi range of up to 150 feet, supports up to 5 connected devices, and has a battery life of up to 10 hours. Worried about security? You can configure the FUEL’s WiFi hotspot to operate with WPA2-PSK[AES] or WPA2-PSK [AES] + WPA-PSK[TKIP]. The FUEL sports Wireless B, G, and N protocols and also has a USB 3.0 port for speedy data transfers. Additionally, the LaCie FUEL operates via WiFi very much like a proxy. You connect your device to the FUEL via WiFi, then through the FUEL settings you point it to your WiFi. On the outside, the FUEL isn’t all that complicated to look at. Up front, there are two LEDs and a Power button. The first, is a power LED. The LED indicates 3 things: Green solid: Fully charged, Amber: Charging, Red: Battery is low. The other LED indicates the wireless broadcasting state. On the left, is a USB 3.0 Port and a tiny reset port. When using the FUEL with a laptop, there are a number of ways to interact with the drive. First, you can simply connect the drive to your PC through a speedy USB 3.0 port. Although that isn’t much fun, it does offer the best performance. If cords aren’t your thing, connect via WiFi and allow up to 5 of your brethren share your stuff. If you were to type www.laciefuel.com into your browser while connected, you can browse, play, upload, and interact with your data easily. The interface is somewhat drab and confusing, but it does get the job done. While exploring, if you find something that strikes your fancy, click it and it will open in one of the Windows default applications. For me, I prefer to explore the FUEL through windows file explorer. Just access this like you would any network share… \\172.25.0.1 and you are off and running. Just make sure you don’t have ECO mode enabled, it turns off SAMBA. While operating the FUEL from an iOS or Android device, connect to it via Wireless networks in your device’s settings. 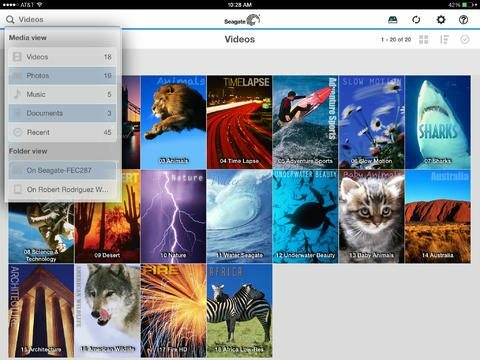 Once connected, open your browser to laciefuel.com and install the Seagate Media app. 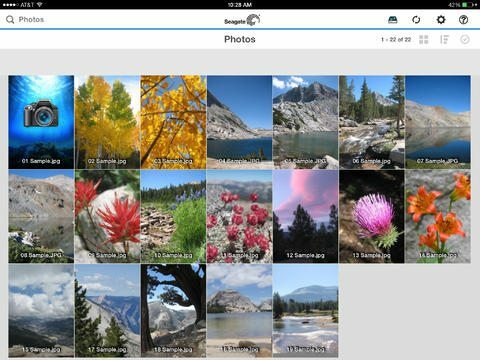 The app is a quick window into your FUEL and allows you to navigate your data or media collection easily. Unfortunately, the application doesn’t have the ability to play MKV files. When attempting to play, it prompts to you buy one of two apps from the app store, Good Player and Ace Player. Both are $2.99 on iOS. Unfortunately, there is no VLC support. Typically, I don’t get all excited about external storage devices. However, LaCie FUEL is something different. The FUEL allows me to connect to just about anything… and even with more than one device at a time. While flying, I can be accessing tons of music while my significant other is watching her favorite TV show (Doctor Who of course, or if you ask her.. Grey’s Anatomy). Don’t get me wrong, the web interface could be a bit better, and the iOS / Android app has its limitations, but look at the alternative… um… wait… there is none! 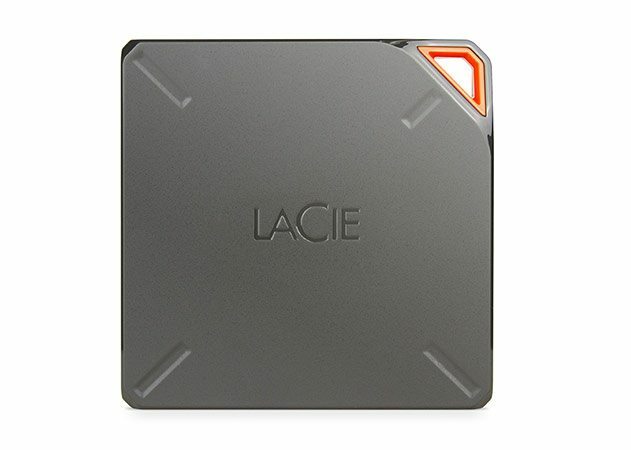 Bottom line, the LaCie FUEL is one of those must haves for travel or work on the go. Is it worth a nearly $180.00 USD price tag for a 1TB drive? Yes… this is an awesome piece of tech.